Brightspace (D2L) will allow you to customize your personal profile as well as the ways you will receive notifications regarding your course activity. Adding custom notifications allows you to customize when, how, and how often Brightspace (D2L) notifies you regarding your course activity. Notifications are a great way to keep on top of your course load, get automatic alerts to your email or mobile device regarding course changes and updates, and to receive reminders about upcoming work. 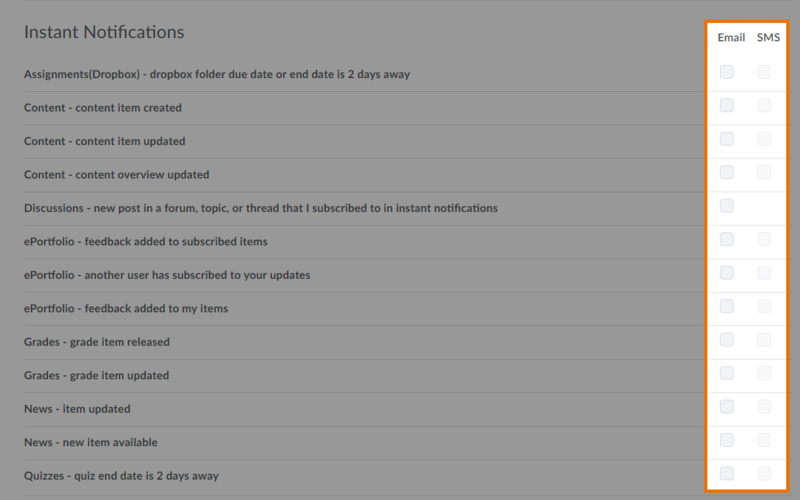 1) Click your name in the top right of your page, and select Notifications from your personal menu. 2) Enter the email address you use most often. While it is strongly recommended that you use your @mun.ca email address, you can provide a “custom email address” (such as Hotmail or Gmail) by clicking change your email settings. 3) NEW! Enter your mobile number to receive text message notifications. Carrier charges might apply to text messages you receive. Check your phone/data plan. 4) Decide whether or not you want to receive a summary of activity for each of your courses. If “daily” is selected, you will receive a daily summary of the changes that were made in that course. If “never” is selected, you will not receive these summaries. 5) Under “Instant Notifications” select which items you want to receive Notifications about, here you customize which notifications will come via email or mobile, or both. Simply apply a check mark next to the item you would like to receive notifications on. 6) Choose whether you would like to receive notifications on current, future and old courses. All Brightspace (D2L) users have their own “About Me” page where they can upload a picture of themselves and share personal information (e.g., social networking sites, career goals, volunteer work, etc.). If you choose to upload a picture, it will be visible in the Classlist and in ePortfolio presentations. Although filling out your profile is optional, it it highly recommended – your profile gives your online environment a more social and personal feel. 2) Fill in the text fields of your choosing. 3) If you want to upload a profile picture, click Change Picture, browse and select your image, and then click Done. 4) Click Save and Close.